From the frozen ice wastes of the far north to the cool boreal forests Endur in the far south, from the barren coast of the Dynasty to the fertile lowlands of Daij overlooking the vast Sea of Dragons, three continents surround the Inner Sea, the ancient heart of all civilization. The spine of the western continent is formed by two major ranges - the Altan Tepe mountains to the southeast, merging into the ice pinnacles, and the Cordur mountains to the west. with the misty highlands of Shao'Saye stretching between them. The whole western part of the continent is the dominion of the Dynasty, a closed-off nation in which an ancient, hereditary, yet utterly destructive form of magic determines power. The central southern part was long ago where the Kyran empire rose to power on armies of demons conjured from the netherworld, and ruins from that time still the land that only the bravest dare to inhabit. Close to the coast, the City States have established themselves as a major trade power, whereas nearby the republic of Firannos is struggling to resolve its internal issues. Several poorer kingdoms broken off ancient Llaraid are found on the coast further east - Aedyn, Kerbryhaine, Arnnais and Conedd being the most important of them. Finally, the archipelago of the Ea lies in the far east, stretching between the continents and merging into the icy wastes to the North. The Great Desert forms the heart of the southern continent. There lie the ancient and mysterious pyramids of Dai, of which none remembers the origin. To the East, the highlands of Bhatar shield the desert from the moist winds coming from the Sea of Storms, creating the fertile lowlands of Erissa and Moih on their windward side. On the still arid northern coast, the Eloran Empire and its ancient enemies, Qatar and Harantish, can be found. 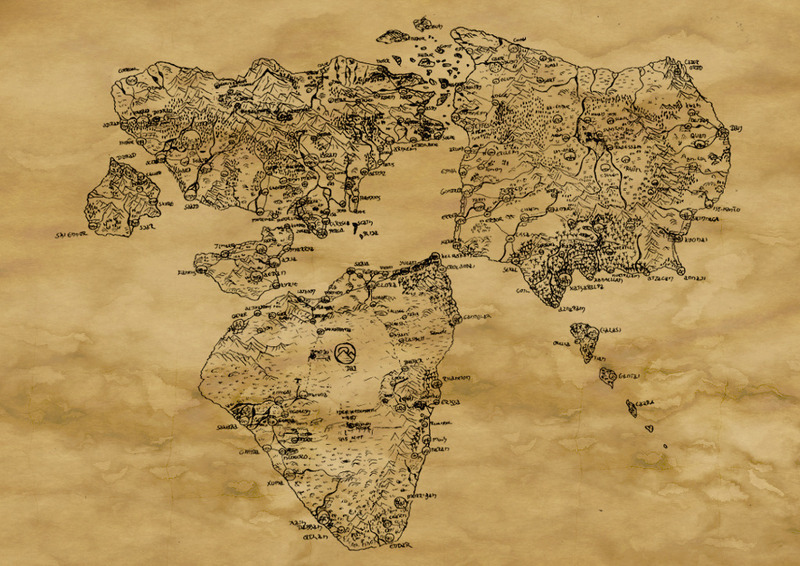 The whole western part of the continent is occupied by the reclusive empire of Ngoresh. Only two major trade routes cross the great desert - the Western Caravan Route connects the Eloran Empire with Ngoresh, passing Tumet'Ai, whereas the Eastern Caravan Route serves the spice trade with Erissa and leads via the highlands. The western coast of the Eastern Continent is occupied by several feudal kingdoms - from north to south there are Norresk, The Marches, Arlund, Toman and Gondred. The sub-tropical nation of Harantish controls the Straits of Harantish, leading from the Inner Sea into the Sea of Storms, and profits hugely from the tolls extracted from City State and Eloran traders enroute to the Aznari Kingdoms or Erissa. In south lie the Lands of the Aznari - once a proud nation of conquerors, now under the dominion of the Elorans and exploited mercilessly. Beyond, in the rarely-traveled east, lie the largely unexplored Dreaming Nations, bordering the Sea of Dreams to the south the Sea of Dragons to the east. The heart of the continent, surrounded by the End Reaches to the west, the Black Mountains to the south and the Yen Lo Mountains to the east, hosts the huge swamplands of Er-Darim. Only few have traveled there and come back. Created by Thorsten Renk 2015 - see the disclaimer and contact information.